The clichés about Russian food range from caviar to empty shelves and bread queues, but in reality, the country has a rich culinary tapestry reflecting its position as a crossroads between Europe, Central Asia and the Far East as well as its role as the de facto cultural capital of eastern Europe. 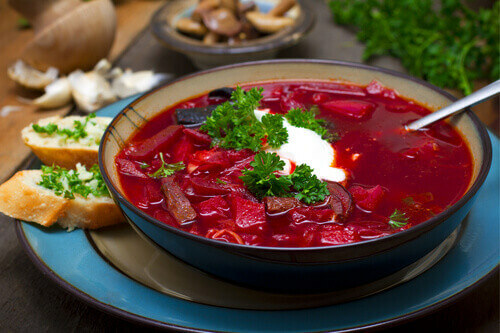 Most people’s knowledge of Russian soups starts and ends with borscht, but this beet and cabbage soup is more of an east European staple rather than uniquely Russian. The quintessential Russian soup is actually schi, a cabbage-based broth which is made with onions in its most basic form and may contain meat, vegetables and spices. This soup is left to stew for hours and is served with rye bread and a dollop of sour cream. Other common Russian soups include ukha, a seasoned freshwater fish and vegetable broth. Its festive variant, kalya, contains a combination of pickled cucumbers, pickle water, lemons and lemon juice. Rassolnik, meanwhile, is a hot soup made from a salty-sour cucumber base and usually contains offal. 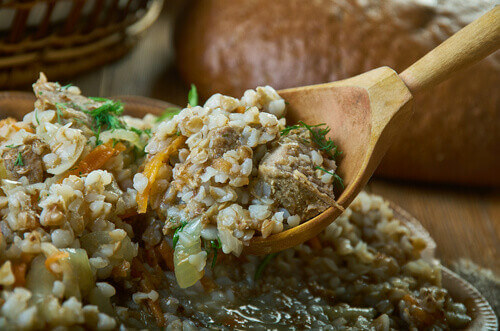 Kasha, a simple porridge, is a breakfast staple thanks to Russia’s ample supply of cereal crops from its western plains. Wholegrain cereals such as buckwheat, millet, semolina, oats, barley, and rice are typically cooked in milk and served with butter, salt, jams or fresh fruit. Salty buckwheat or rice porridge is often served as a side dish. Obviously, Russians don’t call a Russian Salad a Russian Salad – that would be silly. Instead, they call it an Olivier Salad after the famed 1860s Belgian chef, Lucien Olivier, whose original version contained an aristocratic mix of grouse, veal tongue, capers, crayfish, caviar and smoked duck slathered in a mystery mayonnaise said to include French wine vinegar, mustard and olive oil. Olivier’s appetiser quickly became the toast of the town, reinforcing the reputation of top Moscow restaurant, The Hermitage. However, unlucky Olivier soon became the victim of culinary espionage after his green-eyed sous chef Ivan Ivanov, sneaked a peek at his secret sauce and left to unveil a surprisingly similar starter, the Capital Salad, at the rival eatery, Moskva. Food critics and the general public found the new version to be inferior to the original and once Ivanov realized his act of salad skulduggery had not paid off, he promptly published his recipe in a last attempt to be written into culinary history. Thankfully, though, it was only as a footnote. 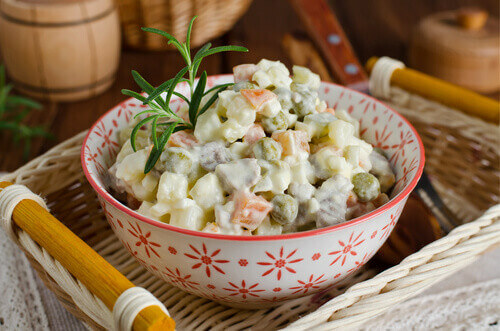 Even though Russian Salad has gone global and has been transformed into a more mundane version of itself with diced potatoes, carrots, pickles, boiled egg, chicken and mayonnaise, Olivier still doesn’t get the credit he deserves outside of Russia. Like their Catholic brethren, followers of the Russian Orthodox Church traditionally do not eat meat on a Friday, meaning that Russian cuisine has a rich variety of fish dishes. 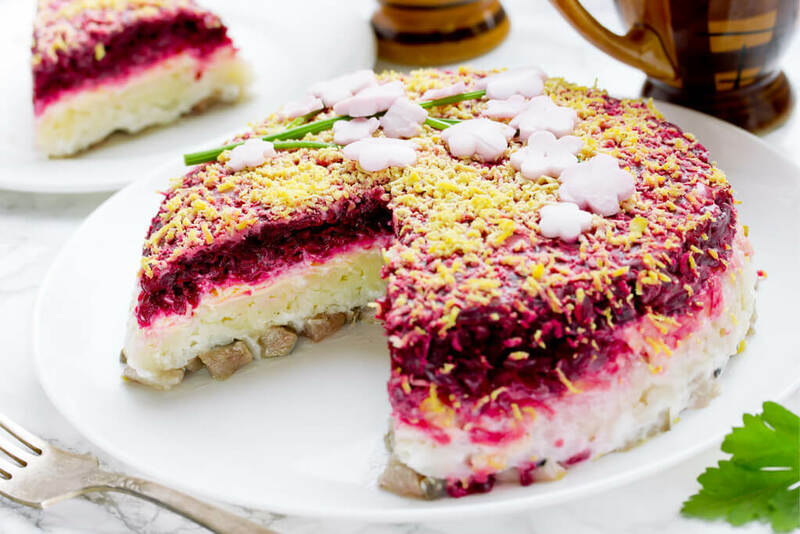 One of the most colourfully named is shuba (herring under a fur coat) made from salted herring covered in layers of grated boiled vegetables, beets, onions and mayonnaise. Saltwater fish is typically preserved through smoking, pickling or salting and is served on a blini like an hors-d'oeuvre. From Poland’s pierogi to Tibet’s momo, every east European and Asian culture has their own form of dumplings. 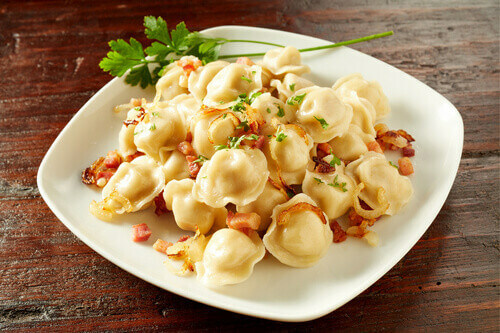 In Russia, it is pelmeni which literally translates to ‘ear bread’ in the dialect of Siberia the region from which these dumplings originate. These pot stickers are filled with a mixture of meat or fish seasoned with black pepper and garlic. The Siberians traditionally freeze pelmeni outside allowing for them to be safely transported by hunters and travellers, making them one of the first frozen foods. However, they are best eaten fresh and served either boiled or in a broth. Also try pirozhki, small oven-baked or pan-fried pastry-crusted pies with meat and herbs fillings. 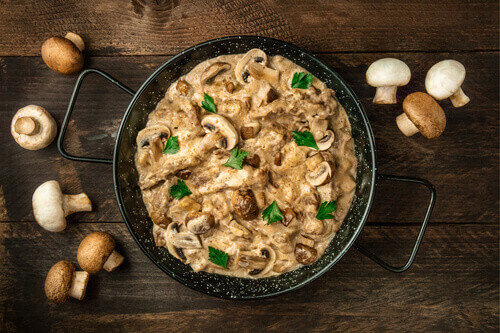 Depending on what foundation myth you believe, Beef Stroganoff is either named after the influential Stroganov family – Russia’s answer to the Rothschilds – or possibly the verb strogat, meaning to chip/shave and describing the cuts of meat used. Made from lightly floured beef cubes, sautéed in a mustard, mushroom and sour cream sauce, the dish has proved to be another one of Russia’s successful culinary exports and every region has given it local flavour. In Scandinavia, beef is switched for sausage and in Brazil, they use chicken or shrimp. 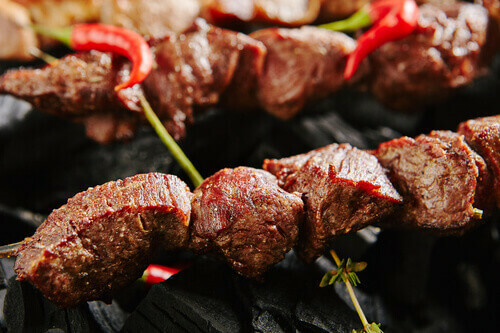 The shish kebab’s chunkier big brother, shashlik is made from chunks of lamb, beef, chicken or salmon grilled on a skewer and served in a pita-style unleavened bread with pickles and a spicy sauce. This dish originates in central Asia (where it is made with lamb) and has spread throughout Russia as a popular street food. 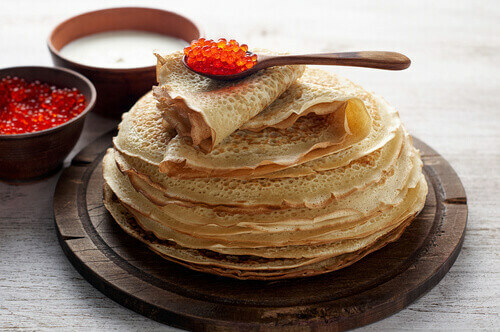 These crêpe pancakes are typically made out of wheat or buckwheat flour and served with a savory topping – anything from a spoonful of caviar to smoked salmon or pickled vegetables. Blini has a sweeter, larger cousin, the syrniki. These are made using cottage cheese or curd, formed into small ice hockey puck shapes and fried. They are served for breakfast or dessert with a dollop of jam or honey and sour cream.